Address: 40 St John St, Launceston, TAS. 1919 Series Perfed (underprint) 1d, 2d, 3d, 6d, 1/-, 2/6d. 1920 Series Perfed 1d(p12), 6d(12x11�), 6d(11x11). 1919 Series Perfed (underprint) 1d R4, 2d R4, 3d R4, 6d R4, 1/- R4, 2/6d R4. 1920 Series Perfed 1d R3, 6d(12x11�) R3, 6d(11x11) R4. 1920 Series Roulette 10/- R4. By the 1860’s Royal had ten offices in Australia and it continued to grow through mergers at home and abroad. In 1919 it acquired the rival Liverpool & London and Globe Insurance Company in what was, at the time the largest merger in British Insurance history. This merger was a trend that was to continue across the industry through the 20th century culminating in Royals merger with Sun Alliance, itself a product of mergers between the Sun, Alliance, London and later Phoenix Insurance companies. 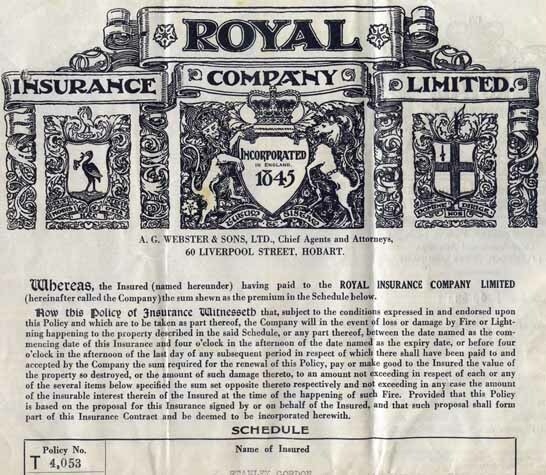 Device: The Royal Insurance Company were prolific perfin users and they are known to have used a range of devices that mainly produced patterns in the format RI/CO/LD but also RIC and RI/CO. Refer to Related Patterns section below for descriptions of their other devices. The RI/CO format is most commonly only found used in Tasmania, the exception being RI/CO.a (NSW) which is a very rare pattern found only on NSW revenue stamps. Other strikes of RI/CO are partial strikes of RI/CO/LD devices. See explanation under Queensland chapter RI/CO/LD.a. The RI/CO.a pattern has previously been reported with usage from 1912 until as late as 1948 and further it has been reported used on the postage stamps of Western Australia. Neither of these reports are supported by the evidence. Postmark evidence does not show use of this RI/CO.a device before 1920 and they are exclusively Launceston strikes. This miss report is likely spawned by confusion with partial strikes of the c1912 RI/CO/LD devices, which the company issued in many of its offices across Australia. This RI/CO.a device is definitely a Launceston device and its usage is limited to 1920 until around 1930 when it was replaced by the RI/CO.b device. The RI/CO.a device was a single head device and it features quite fine pins, which did not wear well, and the pattern is characterised by frequent missing pins in the ‘I’ and the upper and lower right hand pins of the ‘C’. In other instances the ‘R’ can be almost missing or represented as a collection of blind strikes. 1919 Series Perfed (underprint) 1d, 2d, 3d, 6d, 1/-, 2/6d, 10/-. 1920 Series Perfed (plain) 12x11.5, 5/-, 10/-. 1920 Series Roulette (plain) 1d, 2d, 3d, 6d, 1/-, 2/6d, 5/-, 10/- (orange), £1. Last LSD Series 1d, 2d, 3d, 4d, 5d. 1919 Series Perfed (underprint) 1d R2, 2d R2, 3d R2, 6d R2, 1/- R1, 2/6d R3, 10/- R4. 1920 Series Perfed (plain) 5/- R3, 10/- R4. 1920 Series Roulette (plain) 1d R2, 2d R4, 3d R1, 6d R2, 1/- R1, 2/6d R3, 5/- R4, 10/- (orange) R3, £1 R3. Last LSD Series 1d R4, 2d R1, 3d R4, 4d R2, 5d R3. 1929 Perfed 9D (green) R4. Device: This was a single head device and it came into service in about 1930. 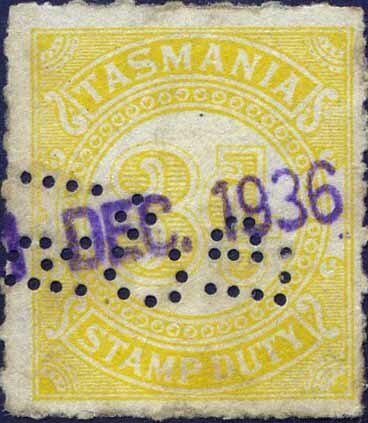 The pattern is found on the revenue stamps of Tasmania as well as the postage stamps of Australia. Usage starts around 1930 and with respect to postage stamps it continues up until at least 1970. There are no reports of revenue usage on decimal issues and company cachets on perfined revenue stamps do not show use past 1965. 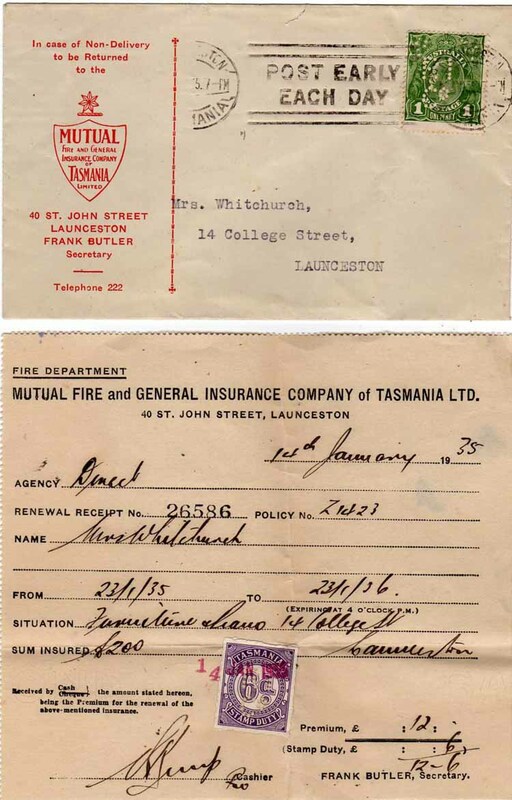 Interestingly the pattern is found used on documents of the "Mutual Fire Insurance Co of Tasmania", later named "Mutual Fire and General Insurance Co of Tasmania". This company were more than likely a subsidiary as they featured a very similar logo to Royal Insurance. Address: 60 Liverpool St, Hobart, TAS. 1920 Series Perfed (plain) 1/-, 2/6d, 10/-. 1920 Series Roulette (plain) 1d, 2d, 3d, 6d, 1/-, 2/6d, 5/-. Last LSD Series 1d, 2d, 4d. 1929 Roulette 9D (brown), NINEPENCE. 1920 Series Perfed (plain) 1/- R4, 2/6d R4, 10/- R4. 1920 Series Roulette (plain) 1d R4, 2d R3, 3d R2, 6d R2, 1/- R1, 2/6d R4, 5/- R4. Last LSD Series 1d R4, 2d R4, 4d. 1929 Roulette 9D (brown) R2, NINEPENCE R4. 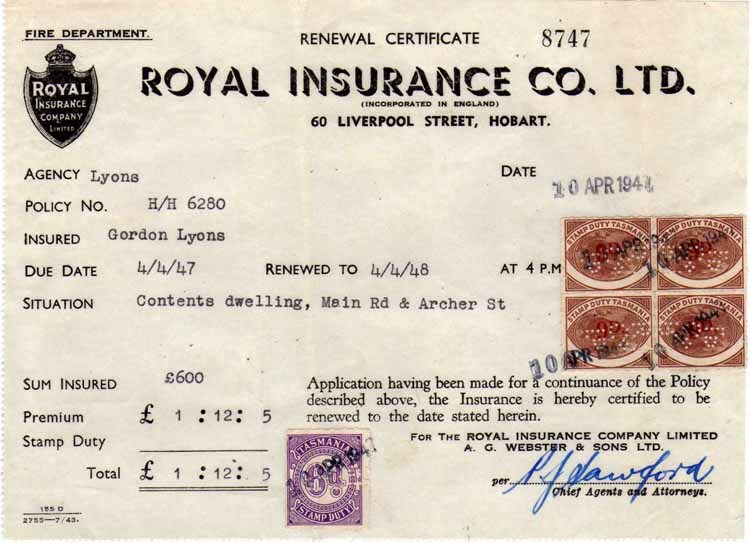 Device: In c1912 Royal Insurance purchased a number of near identical devices for their offices across Australia including Melbourne, Sydney, Newcastle, Brisbane, Adelaide and Perth. From the evidence of multiple strikes it is clear that these were a series of single head devices. There may have been more than one device for country offices in Queensland or larger offices such as Melbourne and Sydney. 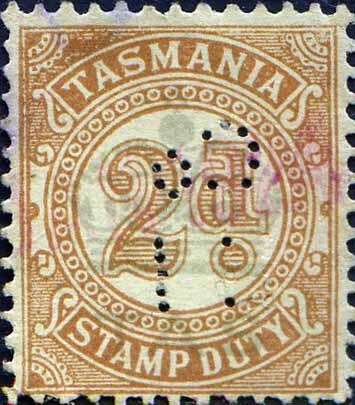 In previous studies of private perfins on Australian stamps this Tasmanian RI/CO/LD pattern has been considered to be the same pattern as the c1912 RI/CO/LD devices. This is not the case and the Tasmanian RI/CO/LD pattern is distinctly different with the C of CO being orientated towards the left of the pattern directly under the left hand leg of the R. In the c1912 patterns the C of CO is more central under the RI. This Tasmanian device was a single head device and it was most likely located at the companies Hobart office. 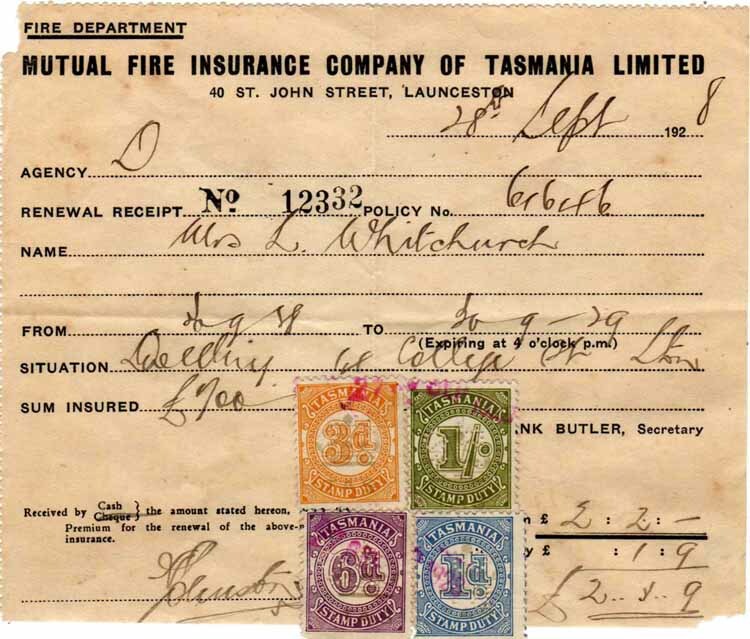 The pattern is found on the revenue stamps of Tasmania as well as the postage stamps of Australia for the period 1927-1963. Early usage is characterised by rather fine holes very much in the style of the circa 1912 devices but in the late 1940’s and early 1950’s strikes become incomplete particularly in the CO and LD. In the late 1950’s the device seems to have been repaired and strikes from this date are clearer and feature bolder, thicker holes indicating that the device was repaired and thicker pins fitted.